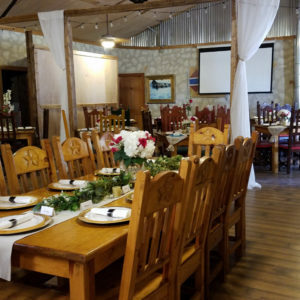 If you need a private venue for your special event, choose Cagle Steaks. 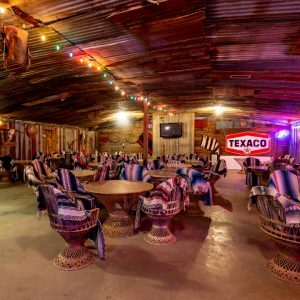 We offer 8 private party rooms for large gatherings, each with a unique atmosphere you won’t find anywhere else. Our private party rooms are listed below. 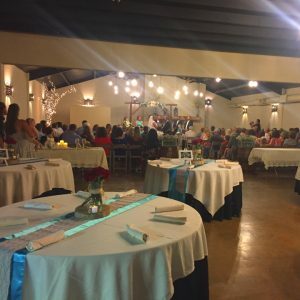 The Rafters Building is our largest catering facility capable of seating 85-350 guests. The size of this room is great for weddings, receptions, rehearsals. Christmas parties, birthdays, reunions and corporate events. The room is available for evening events Monday through Saturday. The meal is served buffet style and there is a bar available in the room. The large front porch allows for mingling in the evening and the dance floor gives you plenty of room to kick up your heels! The Townhouse is a large, open, private building that seats between 60 to 120 people. 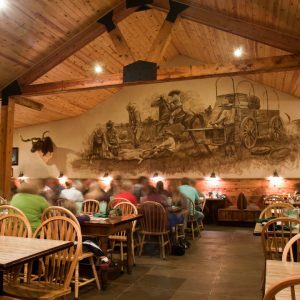 The room features rustic wood tables and chairs and a mural of running horses along the walls. The Townhouse also has an attached and enclosed outdoor courtyard that features a bar, fire pit and plenty of seating. 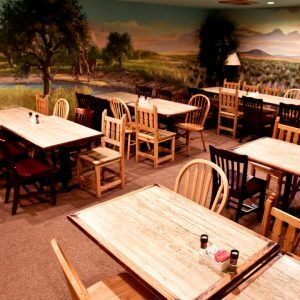 There is no doubt your guests will enjoy the wide open space of the Wild West Room! 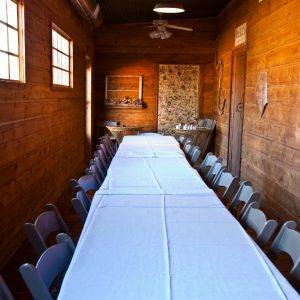 The Cookhouse is a private catering building located on the far west side of the property that seats 35 to 60 people. 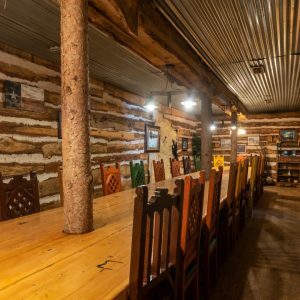 The rustic features of the Cookhouse will make your guests feel as though they have stepped back in time. The Cookhouse courtyard features a gazebo and lighted dance area. Esmondo’s is a private catering building located separate from the main restaurant. It seats 30 to 38 people and is the perfect gathering place for intimate parties, meetings and rehearsals. The Esmondo’s room is reminiscent of an old log cabin complete with a carved wood table build around three wooden pillars. The ambiance of this room is sure to please any guest. The Saltlick is a casual private building located off the main courtyard. It functions as the waiting area on the weekends and often features live music. The Saltlick is available for private use Monday through Thursday. The North Fork seats 35-60 people and is off the main dining room in the restaurant. 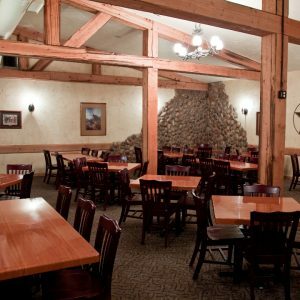 The North Fork is an upscale western room that is perfect for any occasion. The wooden beams and stone wall create an atmosphere unlike any of our other rooms. The Indian Room is a private room located within the main restaurant. This room seats 25 to 40 people and allows the guests the option of ordering off the menu or having a preset menu. The East Porch is a small private room located within the Main Restaurant. 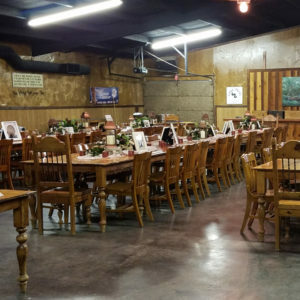 It seats 15-25 people and is a cozy room for small business meetings, family dinners, Christmas parties and birthdays. The East Porch is available for reservations in two hour increments.